We would like to thank Loveland Water and Power, Carollo Engineers and Garney Construction for choosing SSI fine bubble aerators for their Wastewater Treatment Plant Expansion project. The aerators used on this plant are the SSI PODS model. PODS have become well known in the industry for contractor convenience. SSI PODS aerators come factory assembled on pipe. In the recent past, when a municipality or contractor ordered aerators from a producer like SSI, they would receive boxes of parts and pipes in a partial state of completion. The final assembly of the aerators was left to the site personnel. This included installing membranes and O-rings, and greasing and screwing aerator retaining rings. With the SSI PODS system, they simply lift the header pipes into place on support stands and tighten the unions together to connect the pipes. The days of assembling aerator parts are over. Contractors experienced with different brands and types of aerators have told us at a different site that they have installed 8000 aerators in a tank in four days with this system. The same contractor said that a system that arrived in a state of partial assembly would have taken much longer. 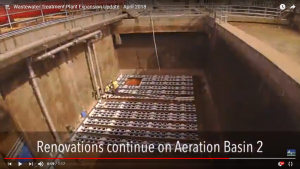 They estimated they would have needed at least one more day to stage the final aerator assembly beside the tank. Other contractors have told us that they save between 20-30% of the installation time with the SSI PODS aerator system. There may be additional time savings during start-up since the attachment of the POD aerator to pipe is done by machine, so there is less variation in torque than with a crew of laborers doing the job. THE SSI PODS AERATORS INSTALL SO QUICKLY ! The same system with aerator heads factory installed on pipe (SSI PODS) has been successfully installed at other facilities, such as Lakeland-Glendale WWTP, Florida, Chambers Creek WWTP (Tacoma), Washington, Green Bay WWTP, Wisconsin and Southerly WWTP (Cleveland), Ohio. It costs a little bit more to buy and ship your aerators this way, but most of our customers think it’s worth it.